Scott T. Starbuck was raised fishing rivers near Mt. Hood, in eastern Oregon, and on the Oregon coast. He still dreams swarms of orange salmonfiles gulped by giant redside trout on the Deschutes. After high school, he ran the Tradewinds’ Starfisher in Depoe Bay. Later, he was a 2013 Artsmith Fellow on Orcas Island, 2014 Friends of William Stafford Scholar at the “Speak Truth to Power” Fellowship of Reconciliation Seabeck Conference, and a writer-in-residence at The Sitka Center for Art and Ecology, just inshore from where he fished for salmon, halibut, lingcod, and rockfish eight years. Now he serves as a Co-Creative Writing Coordinator at San Diego Mesa College, and writes an ecopoetry / fishing blog Trees, Fish, and Dreams at riverseek.blogspot.com. Starbuck’s fine art book of fishing poems River Walker (Mountains and Rivers, 2012) sold out of it’s small press printing of 200 copies in about a year. 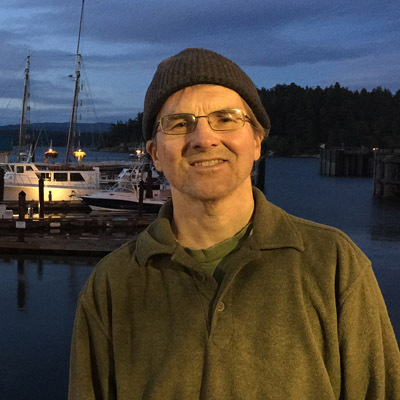 Based on his love for salmon and salmon people, he wrote The City of Depoe Bay’s Memorial Against Offshore Oil Drilling to the Oregon Governor’s Ocean Resources Management Task Force in 1989 to help stop oil rigs off the Oregon Coast. He was awarded a second PLAYA residency in July 2016 to work alongside climate scientists or science writers, artists, and authors as he develops his third book of ecopoems Chewaucan Wars. He said “During spring, summer, and winter breaks from teaching, I spend more time with my fishing rod than I do with people.” His fishing articles or poems appeared in Yale Anglers’ Journal, Salmon Trout Steelheader, The Sunday Oregonian, Northwest Fishing Reports, Talking River at Lewis-Clark State College, The Raven Chronicles, and many other literary journals. as salmon die in the river. into shadow like a mermaid. dead ones shine as much as the living.